Having dreams about bees or bee colonies has a strong underlying social context, but it can also have more general meanings depending on the situation experienced in a particular dream vision. A fairly common dream scenario is about myriads of bees invading houses or apartments, to the point of suffocating the dreamer or covering the entire place with the orange and black moving carpet of these insects. These types of visions usually predict big disappointments ahead or losing focus in relation to something important we are presently trying to accomplish. It is also quite likely that the recent efforts we put into reaching our goals have been hampered by obstacles and re-emerging issues, so we lose confidence and become hopeless and unmotivated. And because bees are highly social insects, dreams about them are usually experienced during stressful and busy times, “bee” it at work, inside family life or as a result of social interactions with others around us. Other, more traditional dream interpretation sources attribute the visions of bees seen inside the house to an unexpected or sudden death soon occurring in the household. The imagery of bees coming out of or being present inside our bodies or various parts of our body, especially with the characteristic buzzing sound, could be a sign of some disease or health issue developing or soon affecting this particular body part or organ. It is often so that the body is trying to send signals of distress and physical unwellness through subconscious imagery of these insects which are very noticeable in real life, either because of their morphology or ubiquitous presence in our lives in one form or another. All of the variations of dream scenarios with a bee or bees stinging the dreamer or someone else present in the dream usually carry positive connotations. The older, traditional dream interpretation literature sources draw parallels to real-life experiences, when remedies and products produced by bees, such as honey or beeswax, had been long used to treat a broad range of maladies or less serious health issues or for cosmetology purposes. So when you dream about being stung by a bee or bees, try to remember some additional details present in the vision, but most likely you are in for a pleasant surprise or encouraging news following the dream. 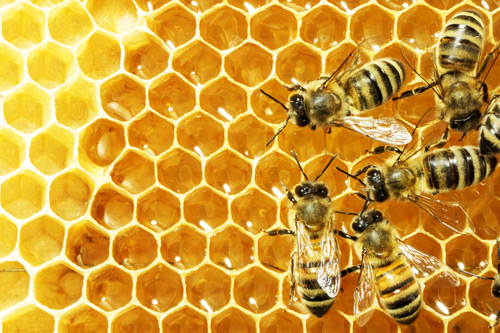 Generally speaking, bees as symbolic representations of the insect kingdom stand out a great deal from the rest of these creatures, both because of our visual perception and as far as practical aspects of their use are concerned. Depending on your current life situation, personal ambitions and daily responsibilities, you can find out what’s in store for you or where you are headed if you had a vision about bees and other accompanying symbols in the same dream which you are trying to decipher.